Do you love strawberries? Check out this Zjskin Strawberry Huller Fruit Corer Remover for $2.89 Shipped. "This is one of my favorite kitchen gadgets and I give one to almost everyone I know, especially at baby showers! It doesn't take up much space and it very handy during strawberry season. It did take a bit getting used to and I've perfected my own scoop and twist for lack of a better way of describing it. I highly recommend this." Hurry, prices can change at any moment. Today only, Save Up to 40% on a great selection of Summer Infant Baby Essentials. You'll find savings on items like Playards, Strollers, Baby Monitors, Infant Wraps and More! This one-day offer is valid on February 1, 2015, or while supplies last. Discount is already included in the current Amazon.com price. Applies only to purchases made from Amazon.com and does not apply to products purchased from third-party merchants on the Amazon.com website. Football Fans you gotta check this one out! Today ONLY, you can get this Boelter NFL 15.8 Quart Portable Party Refrigerator for $169.99 (Retail $269.99)! -11" wide, 14" deep, 17" height; weighs 15 lbs. I've had one of these little things for years and now I find my kids using it too! Hurry over and check out this Orange Peel Peeler for $1.79 Shipped. Estimated Delivery Date: Feb. 26 - March 16 when you choose Standard at checkout. -Shape&amp;Color: Show as pictures. Umiwe Co.Ltd's Original packing with high quality warranty. *Price can change at any minute, so hurry! Shop NOW. Head over to Old Navy and save 20% off your purchase, online &amp; in stores with code: SAVE. Plus, All Jeans, Shirts &amp; Outerwear are ON SALE Up to 40% Off. Cannot be combined with Super Cash. Right now get this Thames &amp; Kosmos Astronomy Space Exploration Set for $9.99 (Retail $36.95)! Typically it's shipped pretty quickly, so I just took the risk and ordered for my kids Valentine's Baskets. HURRY over and grab this Set of 12 Coloured Silicone Cupcake/Muffin Cases for $3.55 SHIPPED (Retail $14.99)! That's less than buying paper. Keep in mind price may change quickly. Hurry over and grab this Minecraft Steve with White Horse Action Figure for $9.48 (Retail $30)! Heads Up! 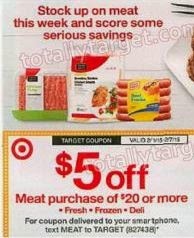 Beginning this Sunday, 2/1, Target will be offering a rare $5 off a $20 + meat purchase coupon. This coupon will include fresh meat, frozen meat and deli meat! Look for this coupon in your Target ad or text the word MEAT to 827438 (coupon will arrive on 2/1). This weekend only, enjoy Free Shipping at the Disney Store with any Frozen purchase with CODE: FROZEN. •Plush is Buy One Get One for $1! •Oh Baby! Sale! Up to 40% off Baby Favorites!